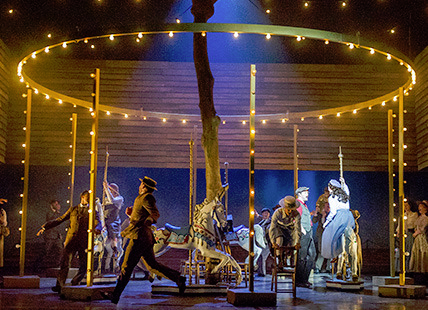 Simply put, Opera North’s production of Rodgers & Hammerstein’s ‘Carousel’ could and should be used as the very yardstick for any musical – it was excellent from start to finish. From that very start, it was clear no detail had been overlooked, and no expense been spared. The set was evocative and beautiful, a New England coastal town springing up with wonderful dusky blues, twinkling fun-fair lights, hope and innocence; we could almost hear the soft lapping of water against creaking fishing boats when silhouetted masts appeared. The costumes looked authentic and of a high-quality and the superb, professional 30 piece orchestra gave the whole show a sumptuous feel and reminded one of the absolute delight audiences experienced in days of yore, when life consisted mainly of drudgery, luxuries were few and far between and every second in a theatre was to be savoured, relived many times and forever treasured. The dancing, a blend of contemporary, jazz and ballet was sharp, focused and oozed class and energy but the real surprise was the voices- boy, can this cast SING! Their voices were strong and filled with emotion, belting out classics such as ‘If I loved you’ and ‘You’ll never walk alone’ with the freshness of a song performed for the first time. Aoife O’Sullivan as Julie’s carefree, comical best pal, Carrie, her intended beau Enoch Snow, played by a jolly Joseph Shovelton and Stuart Neal (Billy’s smooth-talkin’ criminal friend) often stole the show with their comical delivery and Alex Newton was wonderful as the heart-broken orphan Louise Bigelow (and fantastic dancer, to boot). Anthony Warren as the Heavenly Friend was completely believable and a strong and reassuring presence, but it was Keith Higham as the rogue with a heart, Billy Bigelow, and his gentle love Julie Jordan, played by Gillene Butterfield, whose doomed love story kept us fearing the worst but always hoping for a miracle. They were convincing and moving as two young lovers who were clearly unsuited but irresistibly drawn to each other as foolish moths to a flame, with Julie’s naïve devotion and Billy’s rash decision-making and immature behaviour producing ripples that are felt many years later. It was refreshing to see that, over and above the lighthearted humour, serious psychosocial issues such as bereavement and worker’s rights were alluded to and, importantly, domestic violence was addressed head-on and denounced, despite it being seen as a much more acceptable in the eras in which the play was set and adapted. If you like ‘The Sound of Music’, ‘It’s a Wonderful Life’ and other classics such as ‘Harvey’, you will enjoy ‘Carousel’. The enduring message here is that lovers may die but love cannot, and friends can always be found to buoy us up when the loss of love threatens to end all that is good. This production brought a tear to many eyes in the audience, if the sound of sniffing and the widespread appearance of hankies was anything to go by. So, switch off your ‘phone and engage your heart for this is a worthwhile show indeed- take your family, especially the older generation- they will cry and thank you for it.